For classification, labeling, and protection: You must have an Azure Information Protection plan. For protection-only: You must have an Office 365 plan that includes Azure Information Protection. If you have questions about licensing, read through the frequently asked questions for licensing. If you have questions about subscriptions or licensing, do not post them on this page. Instead, see if they are answered in the frequently asked questions for licensing. If your question is not answered there, contact your Microsoft Account Manager or Microsoft Support. For more information about authentication requirements, see Azure Active Directory requirements for Azure Information Protection. For more information about the requirements for user and group accounts for authorization, see Preparing users and groups for Azure Information Protection. Users must have client devices (computer or mobile device) that run an operating system that supports Azure Information Protection. No support for handwriting in the Windows 10 RS4 build and later. In addition to installing the client on physical computers, you can also install it on virtual machines. Check whether the software vendor for the virtual desktop solution has additional configuration that might be required to run the the Azure Information Protection unified labeling client or the Azure Information Protection client. For example, for Citrix solutions, you might need to disable Citrix Application Programming Interface (API) hooks for Office (winword.exe, excel.exe, outlook.exe, powerpoint.exe) and the executable for the the Azure Information Protection unified labeling client or Azure Information Protection client (msip.app.exe, msip.viewer.exe). For the listed server versions, the Azure Information Protection clients are supported for Remote Desktop Services. If you delete user profiles when you use the Azure Information Protection clients with Remote Desktop Services, do not delete the %Appdata%\Microsoft\Protect folder. When the Azure Information Protection clients protect the data by using the Azure Rights Management service, the data can be consumed by the same devices that support the Azure Rights Management service. Other editions of Office cannot protect documents and emails by using a Rights Management service. For these editions, Azure Information Protection is supported for classification only. Consequently, labels that apply protection do not display to users on the Azure Information Protection bar or from the Protect button on the Office ribbon. The Azure Information Protection clients do not support multiple versions of Office on the same computer. These clients also do not support switching user accounts in Office. For information about which Office editions support the protection service, see Applications that support Azure Rights Management data protection. If you have a firewall or similar intervening network devices that are configured to allow specific connections, the network connectivity requirements are included in the Office article, Office 365 URLs and IP address ranges. See the Microsoft 365 Common and Office Online section. If you use a web proxy that requires authentication, you must configure it to use integrated Windows authentication with the user's Active Directory logon credentials. Do not terminate the TLS client-to-service connection (for example, to do packet-level inspection) to the aadrm.com URL. 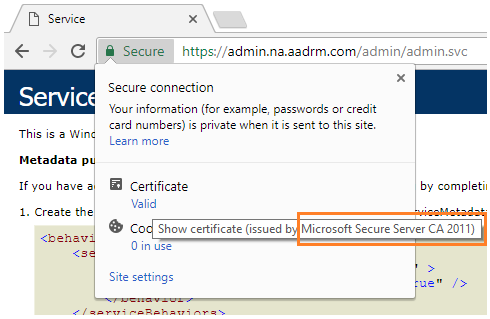 Doing so breaks the certificate pinning that RMS clients use with Microsoft-managed CAs to help secure their communication with the Azure Rights Management service. Don't worry about what the browser window displays. Instead, click the padlock in the address bar to view the site information. The site information lets you see the issuing certification authority (CA). If the certificate is not issued by a Microsoft CA, it is very likely your secure client-to-service connection is being terminated and needs reconfiguration on your firewall. The following picture shows an example of a Microsoft issuing CA. If you see an internal CA issued the certificate, this configuration is not compatible with Azure Information Protection. For information about the additional requirements for this scenario, see On-premises servers that support Azure Rights Management data protection. Running AD RMS and Azure RMS side by side in the same organization, except during migration, as described in Migrating from AD RMS to Azure Information Protection. There is a supported migration path from AD RMS to Azure Information Protection, and from Azure Information Protection to AD RMS. If you deploy Azure Information Protection and then decide that you no longer want to use this cloud service, see Decommissioning and deactivating Azure Information Protection.